In deep fryer or 4-quart Dutch oven, heat oil (2 to 3 inches) to 350°F. In shallow dish, mix flour, salt and pepper. In another shallow dish, beat eggs slightly with fork or whisk. In third shallow dish, place bread crumbs. Pat shrimp dry with paper towels. 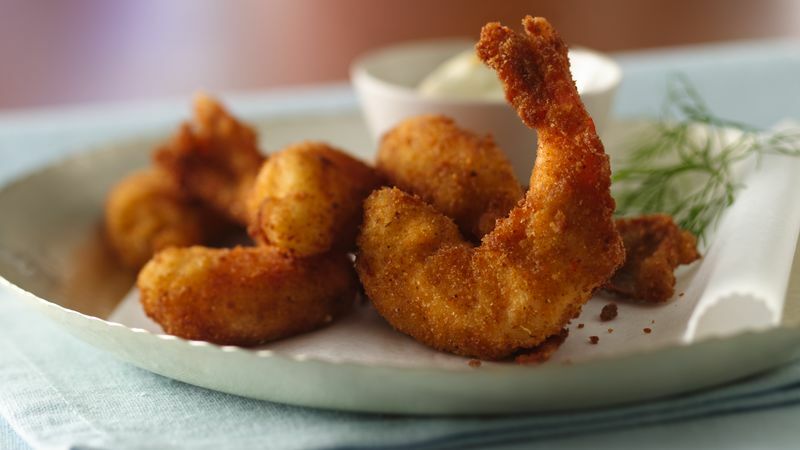 Coat shrimp with flour mixture; dip into eggs, then coat with bread crumbs. Fry 4 or 5 shrimp at a time in oil about 1 minute, turning once, until golden brown. Drain on paper towels. When buying medium shrimp for this recipe, expect to get 31 to 35 per pound, though this number may vary slightly. Watch the temperature of the oil carefully during frying. If it starts to smoke, turn down the heat and wait a few minutes before putting in the next batch of shrimp. Substitute 3/4 lb shucked oysters or clams, drained, for the shrimp. Substitute 3/4 lb shucked sea scallops, drained, for the shrimp. Fry 3 to 4 minutes or until golden brown. Bay scallops, which are smaller, will cook more quickly.